What he did not do was show us what it would look like. Luckily, we don't exactly have to use our own imaginations. During O'Neal's video testimonial of his experience, he described being able to watch a game taking place on the table in front of him in 3D. The video also included behind-the-scenes footage of Magic Leap staff capturing O'Neal's volumetric likeness, which will allow users to "meet" a virtual Shaq. In the context of how Magic Leap experiences will appear, this sounds a lot like the Star Wars demo video that Magic Leap released in 2016. Just replace tabletop space battles with a basketball game and substitute life-sized C-3PO with Shaq and you'll have an idea of what the NBA experience might look like. In the sports context, a demo of an NFL experience viewed through the Microsoft HoloLens lays out similar experiences as well. The video shows HoloLens users viewing 3D game footage projected on a coffee table. Microsoft's NFL concept covers life-sized players, as well. With a flick of a finger, a HoloLens viewer summons running back Marshawn Lynch, who virtually crashes through the living room wall, or Russell Wilson, who demonstrates his throwing motion. Abovitz later added that the Screens platform would be one of the capabilities that will be available to the NBA app. In a blog post published after the presentation, Jeff Ruediger, managing director of Magic Leap Screens, went into more detail. "Using Magic Leap's Screens platform, fans will be able to summon multiple, virtual screens into their field of view, wrote Ruediger. 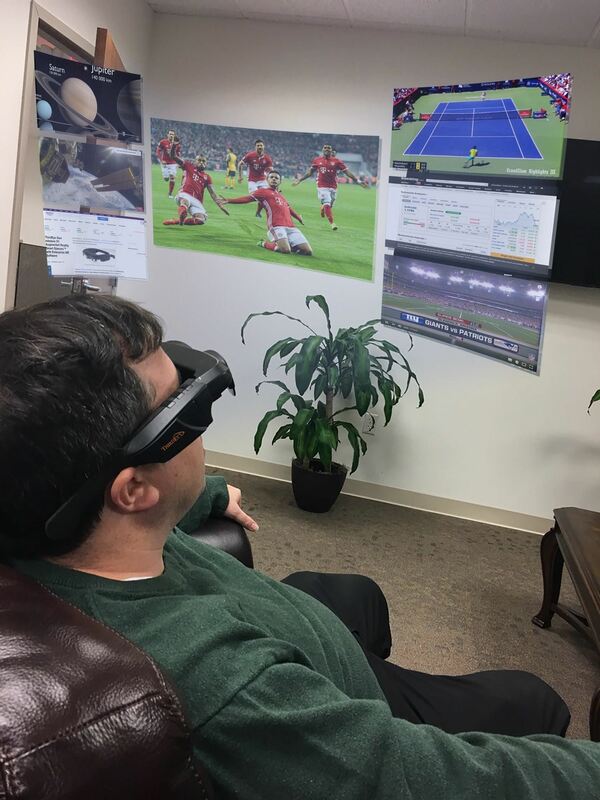 "When paired with Magic Leap's Digital Lightfield technology and spatial computing, these screens can be shown at any size, and in any location combined with supplemental graphics that allow fans to enjoy their favorite stats, replays, and commentary—all without missing the game action." Again, for the Magic Leap experience, we can refer to another demo video from 2016, showing how users will be able to summon up various windows of content around their spaces. AR headset maker ThirdEye Gen envisions a similar concept with its X1 smartglasses. Its platform is called Omnieye and enables users to view eight or more virtual screens in high-definition within their immediate surroundings. Abovitz explained the lack of actual footage during the presentation as selling the experience short, as it cannot be fully-replicated in a traditional video. And while that's a reasonable excuse, others have already demonstrated that they can show off similar capabilities. So when we do finally see what Magic Leap looks like during actual use, the only way to back up all this continued mystery will be to show us mind-blowing visuals that aren't capable on any other device.